On our trip to the Sierras last weekend Kevin and I stopped at the California Railroad Museum in Sacramento. 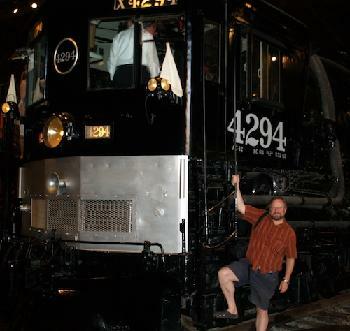 The highlight of the museum for me has always been getting to see the last remaining Cab Forward locomotive, AC-12 4294. 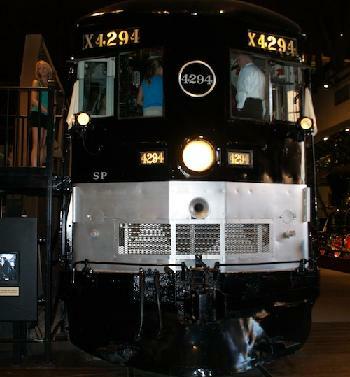 It was also the last Cab Forward built - part of an order of 20 from Baldwin in World War II delivered in 1944 and retired in 1956. Luckily SP was convinced to save the last of these remarkable machines and it was donated to the city of Sacramento. They even let you climb in to the cab. There is usually a crowd of ADD boys sitting in the seats doing their best to yank all the levers and knobs off. It is clear that these locomotives were built to last as all the controls appear to still be there! 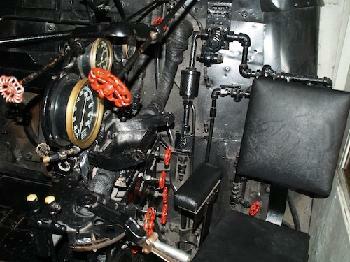 It is surprising how roomy the cab is and of course the view out the front is remarkable for a steam locomotive. A really knowledgable museum docent was on hand to tell people about 4294. After the usual back and forth to establish that, yes, I did know a bit about Cab Forwards, we had a great conversation about what all those controls and gauges were for. Its a LONG way to the back of this engine from the cab and some of the controls used mechanical links to turns thing on the back of the engine. It is hard to get a sense of how big these engines are from pictures. The flash on my camera couldn't light the whole engine at once so I didn't get any good pictures showing the whole engine. There is a lot of good stuff at the museum but the highlight for me was definitly the Cab Forward. It would be utterly awesome to see one these brutes in action. For the rest of the trip I had to let AC4400CWs and SD70s stand in for Cab Forwards on the Donner route. You can visit the cab of the Cab Forward if you wait in line. The Fireman's seat. Look at all of those knobs and levers - all unlabeled.